State Legislators Senators Richard Hildebrand and Caryn Tyson, and Representatives Trevor Jacobs and Ken Collins will give an update on the current session as well as address any issues or questions presented from the audience. 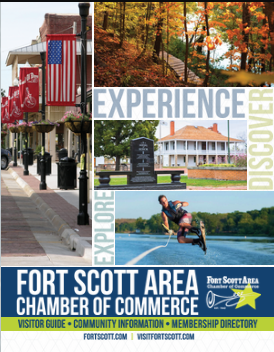 If you have a particular item you would like addressed and plan to attend, you may email the Chamber at information@fortscott.com by 5pm Thursday, January 31st. 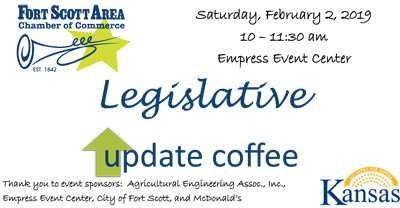 Sponsored by: Agricultural Engineering Associates, Inc., City of Fort Scott, Empress Event Center, and McDonald's. Coffee, juice & light refreshments will be served. Tell your friends - all are welcome!